Let me begin by saying, success in civil services exam is within everyone’s reach. It’s about putting in quality in preparation and a matter of rectifying few mistakes which you are always bound to make, and to have proper guidance to take the preparation in the right direction. In this article I would rather talk about my arduous journey as a civil services aspirant and how I dealt with anxieties it entailed. For me, this long journey of 5 years began in 2011 when I first attempted Prelims. I was so naive and enthusiastic that I took the exam just after reading TMH (Tata McGraw Hill). As expected I couldn’t clear Prelims that year. In 2012, I prepared more seriously but took CSAT for granted that I could solve it without previous practice and planning. It costed me so much so that I lost another attempt because of a low score in CSAT. You need to take breaks sometimes and you also need a good support system to keep you motivated and help you in not giving up your dream. I got married in 2013, and there was a brief hiatus of one year as I wanted to take some time off to be with my family. Marriage made me a stronger person. It never posed as a hindrance to the preparations. I was managing home and also studying for the exams. I became a more efficient and responsible person. By January 2014, I was back to my preparations. In my third attempt, I only banked upon Mrunal.org. I had no peers with whom I could discuss or compete against but religiously followed Murnal.org. Then in July I came to know of Insights. It was overwhelming to browse through the site as it had plenty of information and detailed book lists, strategies and study resources an aspirant needed. I was still scared to start practicing writing mock exams. However, I realised that practice was essential to break the jinx of not clearing Prelims before. This time, I started following both Insights and Mrunal and would ardently read answers from Secure. These readings and preparations did not substitute for writing practice but the synopsis provided by Insights certainly helped in answering the Mains comfortably. Unfortunately, I could not make it to the Final List after clearing mains with my limited preparations. After the CSE result of 2014 I was left with hardly a month to prepare for prelims of CSE 2015. Insights test series helped me in a very quick revision and it was extremely helpful in clearing the exam. This test series covers entire syllabus and helps in retaining the information. This year it got even better as the test schedule was in tune with the study schedule and in addition to the regular syllabus, it covered India Year Book, Various Government reports, Old question papers & Current affairs. It’s so comprehensive that you wouldn’t feel anything missed out. Following the study schedule and test schedule will boost one’s confidence in the preparation. I gave my first attempt with no knowledge of the exam at all. This was absolutely wrong as it led to losing a precious attempt and it created a mental block, especially when one talks about the number of attempts one have made. In the second attempt, I could not estimate the speed and planning required for qualifying the exam and was deceived by the apparent simplicity of CSAT. There too I lost another attempt. During my third attempt, I secluded myself completely from social gatherings to focus on studies. At the same time, around August Insights notified that it would conduct offline classes but only for people with a Mains experience. I was low in confidence as I had never practiced writing answers and could not even manage to finish the syllabus for Optional. Looking at the sample answers that were being written over there, I felt all the more demotivated. It seemed that I would not be able to meet the presumed standards of the institution and hesitated from contacting them. It’s so strange that I did not know that the classes were being conducted just 1 km away from my place. Such fears and assumptions limit one’s horizons and affects opportunities. I would have been more prepared and focused had I joined Insights at the right time. So never hesitate to seek for help. I did not practice writing during my third attempt and in our fraternity it can be considered a sin. I would feel that reading more would help in formulating ideas and one can automatically reproduce them on paper. In fact, the first thing I wrote during these years was the essay I attempted in Mains exam of 2014. 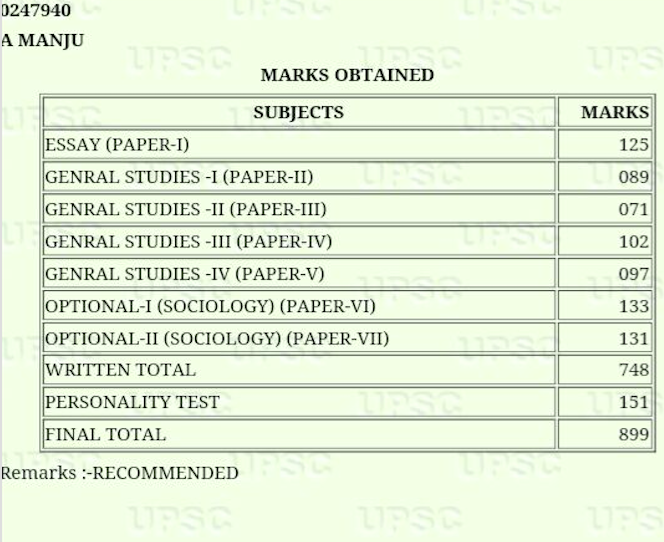 With such inhibitions and flaws in preparation I cleared mains with just 5 marks above the cut-off, but it tremendously boosted my confidence and made me realise that UPSC is no God and anyone with decent preparation and practice can definitely be successful. I joined Insights offline classes in 2015 wherein I engaged in rigorous writing practice, immense revisions, and discussions on Optional with a dedicated group of friends. The very sense of competition one got in classes added an edge to my preparations. Lots of helpful advice from Vinay Sir kept me in the right direction to study well. I rectified all my previous mistakes in this attempt and worked with vigour. I qualified in my fourth attempt, but I know that there are still some areas like presentation skills on which I need to work. There was a common expression that recurred in all the interviews of toppers I had read so far. They would all assert that studying for civil services had changed them as a person. I always wondered what that could mean. However, now I have come to realise how UPSC preparation changes a person. Every time you answer the uncomfortable questions from people regarding your lost career and precious working age you tend to get more humble in one’s approach towards life. One tries to see things in a more positive and focused way. The unsuccessful attempts and years lost do not seem like a waste as they have gone a long way in contributing to making one an emotionally stronger person. The strength and convictions derived from such strenuous circumstances keeps you motivated. Earlier when people used to ask about the PSU job I had quit for preparations I would feel bad but I would think, had I continued in my job, by now I might have got a senior role in my sector. However, putting one’s full efforts in civil services preparation, one can become an Assistant Collector or Assistant Commissioner. One has to have conviction in what one is doing. If one has regrets about the things one could have been doing at the same time then the going gets tough. The idea is to immerse oneself fully in preparing for one goal in life. When people around asked me about 5 years, I would always say “see the government would put a district in your hands, so you need to be worthy enough. These struggles and failures teach a lot in being a successful Civil servant later on.” The preparation phase taught me how to emerge as a strong and balanced person in demanding circumstances. It would be an exaggeration if I say I cherish my failure in 2014. I would remember that day of final result for a lifetime as it taught me to be humble and strong. In fact one motivational article in Insights stated, “if preparation gets overwhelming, just see how it feels when you put your head in a bucket of water, you will know there are more valuable things around and that is life”. I would remind myself of this quote whenever studying would get exhausting for me. I have come to realise that one tends to form a few misconceptions during the preparation phase that one needs to tackle. Your ability – Do not ever undervalue or overestimate one’s skills. The best way is to stop judging one’s skills and intelligence and devout oneself to studying. Take chances. Emphasis on standard of the exam – About half the questions being asked in Mains can very well be attempted if one has a decent understanding of current political and social events. So do not defer writing. Paucity of time – Time is elastic. Accept that there is very little time and you have to utilise most of it. In fact, in my third attempt, I could read the syllabus only once and did not practice writing at all. Whereas, in the fourth attempt, in a span of three and half months I managed to read the syllabus three times, revise it, and take 30 mock tests. One has to learn how to use the time at hand efficiently. Remember, that there is no scope for procrastination, framing and reframing of the timetables, making excuses as one has to stick to a tight schedule. If I can qualify the exam anyone else too can. Preparing for Civil Services Exam makes one a more insightful person than before. One tends to make excuses to defend one’s failures, but that’s a very wrong approach to have in life. The aspirants should know that once you have decided to opt for a career there is no wriggling out of it. Perseverance, determination, and hard work coupled with a respect towards one’s decisions goes a long way in defining one’s life – whether one qualifies the exam or not.